It is good news that you may not require a surgery on your finger. Do allow it to heal though : ) I am happy about the music gigs. We loose interest in things as we grow older. I am sure that the music keeps the kid in you happy. Max has been going to sleep listening to songs lately and it seems to have a calming effect on him and help him "focus"/relax. He has been stashing cars for you and nanny by the door every night before bedtime. He also takes one with him. He calls you on his phone to ask when you are coming back : ) I think we are coming for sure in August, I have booked the vacation time, it is a matter of buying the tickets now. At this point, I will buy them when we come back from Bulgaria at the end of June. I have signed Max for more soccer classes. He seem to really enjoy them! Thank you for considering giving the keyboard to Max. We miss you. Have a great week! Wow! Are we ever busy! And I am so much behind on all tasks... It is hard to keep up with Max : ) He is awesome : )) Just learned how to ride his balance bike. 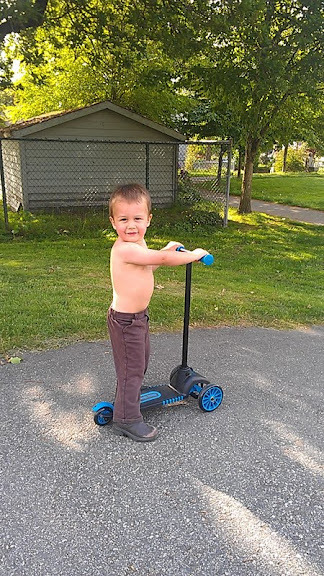 We bought a scooter couple of weeks ago and it was super exciting for him and he is pretty good with it - working on the turns. Max has been drawing a bunch of vehicles very successfully. Some of his favorites remain fire truck and tow truck but he does a pretty good job drawing school bus and ice cream truck to my great surprise and delight. He seems to be paying attention to the things around him. He has been talking a bunch and we tell each other stories at dinner time. Max says "You are funny, Mommy" and tells jokes to us : )) He and tati take turns describing the pictures they browse... it is pretty cool! Max has been going to BlackBirdAcademy more often and it seems to be a better fit than Buddings. They have themes every week and do tons of mini projects. They did a bird week, famer's market week, and butterfly week. There are less kids there and it is more organized environment and Max told me he liked it this morning... We are going to the theater tomorrow with Zeinab and Ava. Next Friday we are off to Bulgaria to see baba, diado, lelia and Vali. We are super excited. We are also planning a camping trip and a trip to Halifax in the coming months. Hehehe. Max is getting bigger and bigger. It is hard to carry him now. I am sad to have to let go of it. But we like to cuddle very much. Life is good!